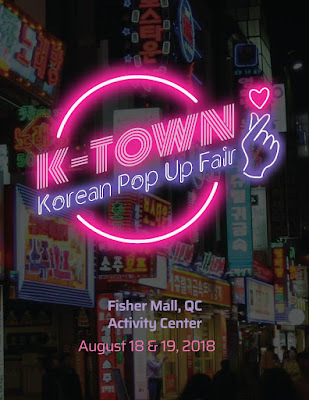 KTOWN Korean Pop Up Fair at Fisher Mall - Triple Joys!!! Good news for all the Korean fanatic out there! Mark your calendars now and be ready to conquer KTOWN Korean Pop Up Fair! Happening on August 18-19, 2018, this event will be happening at the Fisher Mall Activity Center! No need to fangirl on your favorite oppas and idols from afar! Meet up with your fellow fangirls/boys and rave about the latest Korean music, dramas and trends. Get a chance to know more about the Korean Culture and experience them through food, make-up, games and more! So, save the date and do not dare to miss out! See you there! For more information, visit ktown.mnl on Facebook and @ktown_mnl on Instagram. Josephine is a mommy blogger from Manila, Philippines. Mercado del Lago, The Newest Food Destination in Taguig City! That Winning Moment is a #PocketFullOf #Fun with Gardenia Pocket Sandwich! Island Rose Offers Lower Rates in All LBC Branches this October! All Rights Reserved © 2017 Triple Joys!! !.Design by ReigningStill.